In Part I, Ms. Armstrong talked to me about her journey in becoming a world renowned writer and thinker on all things religious. In Part II, she discussed her book The Battle for God and the rise of fundamentalism. Now she talks to me about her book Islam: A Short History and Islam in the modern world. 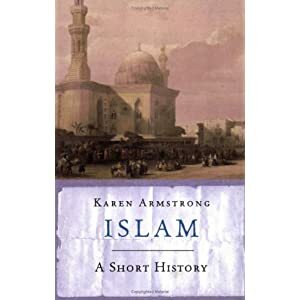 FAITH L. JUSTICE: How did you get involved in writing Islam: A Short History? KAREN ARMSTRONG: One of the editors had worked with me on Jerusalem as a sub-editor before he got into the hierarchy. He knew my work and thought Islam would be good for me. So it was simply knowing the right people. They wanted a short, slim volume to give you somewhere to start, with lists of books for further reading, so you can explore further on. I think it’s a good idea. Forty thousand words is a lovely length, but for Islam it’s hard to compress 1500 years. I had to find the theme and tell the story. FLJ: Other than get people started, what do you want to accomplish with this book? KA: To correct some of the imbalance. The long history of Western prejudice ever since the Crusades has troubled me ever since I became interested in Islam, way back in Jerusalem. Islam was like the United States. Europe was an undeveloped country — way behind the big civilizations after the Dark Ages and the collapse of the Roman Empire. Everywhere you looked there was Islam — Turkey, the Middle East, India, Japan, China, Southeast Asia. It was a far-flung empire. In the 16th Century, it was the most advanced civilization in the world. In Europe, we were coming up, but we hated a lot of people, which we often do when we’re in a position of striving. We approached history with a hostility towards Islam. It comes out in all sorts of ways. In the media they assume that Islam is quite fanatical, intolerant, violent and bad about women, but it’s no better or worse than any other major faith. People think fundamentalism is an Islamic tradition, whereas fundamentalism is in every major faith. And none of the great world religions is good about women! Islam has a much better record of tolerance than Western Christianity. It has a kind spiritual tradition, a philosophy of openness. I wanted to correct that distorted view, because we’ve leaned in the 20th Century it’s dangerous to hold any such inaccurate stereotypical view of people and religion. It damages our own integrity to support an intolerant culture. Islam has its flaws, but it also has great strengths.